Get ready to be wowed by the creative range of Bainbridge Island’s young artists when the Bainbridge Public Library hosts its first Teen Art Show in July. 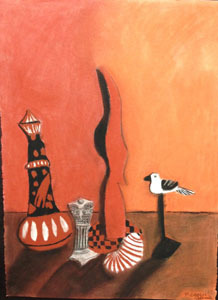 More than 15 young artists from middle to high school grades will exhibit their original artwork in the show. Among the inspiring works to be featured are color and black and white photography, ceramics, pastel and pen and ink drawings, jewelry and even sock monkeys. 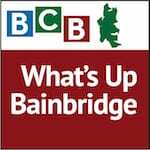 In this episode of “What’s Up Bainbridge,” BCB host Annie Osburn interviews Stefanie Graen, teen services librarian and youth advocate of the Bainbridge Public Library. Also joining this episode are two student artists who will be exhibiting their artwork in the show. 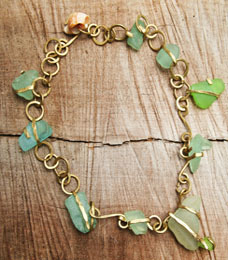 Fiona Morrison, who will enter 8th grade in the fall, will exhibit a one-of-a-kind hand-forged red brass necklace with Bainbridge Island beach glass. 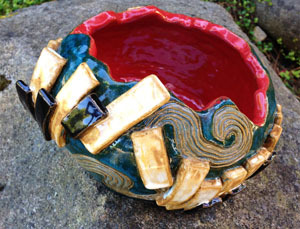 Ana Bucy, who will enter 11th grade in the fall, will exhibit color photography of the Grand Canyon and a ceramic vessel inspired by her lifelong piano studies. Listen here as Graen, Morrison and Bucy discuss the art show and what inspires them to create. On July 12th from 5pm to 7pm, the Library will host an artist reception which also will feature live performances from student musicians, featuring cello, bagpipes and more. Don’t miss it! Learn more about the Teen Art Show at www. bainbridgepubliclibrary.org. Credits: BCB Interviewer Annie Osburn; BCB Audio Editor Tim Bird; BCB Ferry/Music Intro by Dogfish Bay Studios; BCB What’s Up music splash: Dave Bristow.